The Lastolite MegaLite is a large 180cm x 120cm (6' x 4') portable softbox and silver reflective panel. The MegaLite can be used as a floor standing unit or in conjunction with the adjustable stand (with wheels) for ultimate adjustability. The softbox can be lit with one or two studio flash heads (one on each side) depending on the output required. Lights and stand Not Included. 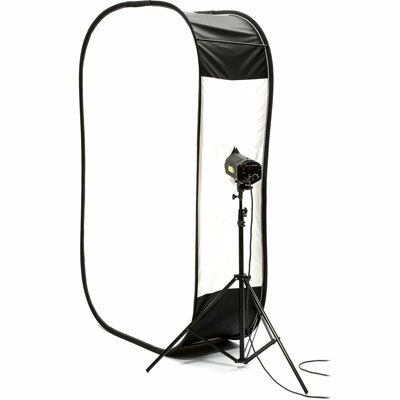 Portable 180cm x 120cm (6'x4') softbox. Folds to a third of its original size. Silver reflector on rear surface. Optional stand with wheels and vertical and rotational movements.